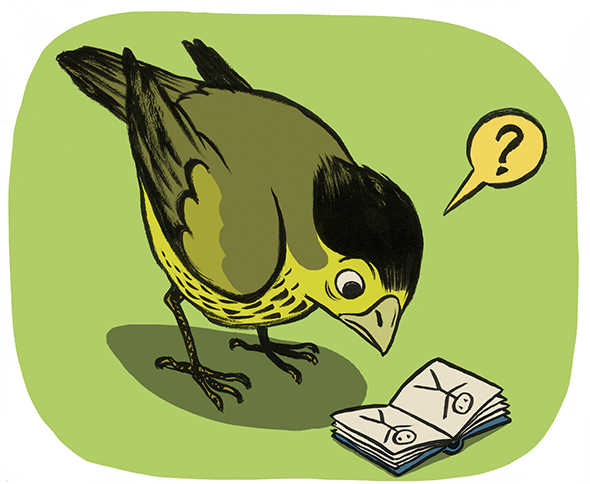 Birding field guides and apps: Technology changes bird-watching and bird identification. The arms race—wings race?—in bird-watching field guides. Is there no aspect of human life that hasn’t been offered an unrequested helping hand from technology? Is there a drowsy Luddite left on the planet who hasn’t one way or another been forced to wince in the cold floodlight of electronic efficiency? We might never know for sure (they won’t respond to my emails), but my guess is nope. Even we birders—who should need little more than a pair of binoculars and a good field guide—are constantly confronted with the next newest thing. In fact, we’re in a boom time for bird field guides in America. Those books with the pretty pictures of wild birds and maps of their ranges—you’ve probably seen one gathering dust on your grandmother’s windowsill—are currently undergoing a swirl of innovation, debate, and controversy. They’re evolving at a pace faster than their living subjects. A good American field guide should contain at least 700 of the 976 species on the official American Birding Association checklist—each species with its own peculiarities of plumage, habit, and song. Even for a single species, plumage differences between adults and juveniles and between the sexes are all equally likely to be encountered in the field, meaning they all need to be illustrated if a birder is to be fully prepared. Field guides offer a uniquely complicated problem of data display: What’s the best way for a book to relate this incredibly detailed mass of information? The earliest field guides—if you could call them that—existed to dazzle, not to teach. Early American ornithologists and painters (among them Mark Catesby, Alexander Wilson, and John James Audubon) created vivid images of American birds, many previously unknown to science. Published between 1827 and 1838, Audubon’s The Birds of America is the grandfather of American field guides—a massive work depicting more than 500 species in nature. (Norton published a mammoth, beautiful edition of Audubon’s chromolithographic prints this fall.) It is a work of breathtaking artistry; the vivid colors and exciting scenes stir a naturalist’s enthusiasm in even the most sedentary contemporary viewers. But it ain’t a field guide. For starters, it’s 3½ feet tall—you’d need a pack mule to take it into the field. Audubon’s drive was inspiration, not utility; in fact, he purposefully excluded any text accompanying the paintings to avoid having to furnish free copies of his toilsome work to English libraries. There were some subsequent landmarks, most remarkably Florence Merriam Bailey’s 1889 Birds Through an Opera-Glass, but most 19th-century bird guides were dense works, filled with detailed notes and observations but only a handful of images. The modern era of field guides began in 1934 with Roger Tory Peterson’s A Field Guide to the Birds. It seems obvious now, but Peterson’s major innovation was simply showing people the dang birds. Instead of bricks of text, similar species were illustrated side by side on a single page. Range maps were added to clue beginning birders in to distribution and migration patterns. Even the simple addition of arrows pointing to key identification points proved a major step forward. For many, A Field Guide to the Birds was something of a Rosetta stone, allowing them to understand a language they didn’t even know was being spoken. Peterson’s field guides were a smash: The first run sold out in two weeks, and they’re still in print nearly 80 years later. The Peterson Identification System of comparison illustration dominated the world of field guides. Peterson’s line of books were the most successful, but National Geographic and Golden introduced popular competitors. The illustrated style was perfected by David Sibley in 2000 with his Sibley Guide to Birds, which I still consider to be the best field guide in existence. The artwork is effectively utilitarian, and the book’s larger size (apparently getting larger in 2014)—which received criticism at the time—permits an unmatched comprehensiveness of plumages and subspecies. And comprehensiveness is what birders need. The fun of birding is that you never know what you’re going to see, so when you see something unusual, you need to make sure you’re covering your bases. One of the first “good” birds I found on my own was one of Mississippi’s first records of black-headed gull, and I’ll never forget sitting in my freezing car frantically leafing through Sibley to make sure I wasn’t overlooking a more common bird before spreading the word. All along, illustrated field guides were dogged by a persistent challenger: photographs. After all, why are these people wasting their lives painstakingly painting every single bird in America when they can just snap a shutter? What’s better than the real thing? A good theory, but anyone who’s ever tried to photograph a bird knows how hard it can be. Even when everything is lined up just right—the bird is facing the right direction, the light is bright enough, there are no leaves blocking the important bits—the bird will flap away as soon as you get the camera raised. For years, getting a quality photo of every species in every plumage was just too difficult, and guides that tried were marred by blurry, underlit, or missing shots. Digital photography has changed everything. Good photographs are now easier and cheaper to take and can be manipulated to improve color and remove distractions. The result is a marked improvement in photographic field-guide offerings; the best include the pocket-sized Kaufman Field Guide to Birds of North America and the comprehensive Stokes Field Guide to the Birds of North America. Mission accomplished: The photos in these books represent precisely how the birds will look when you encounter them in the field. That said, the innovation in these guides is limited; they’re basically the Peterson style with photos swapped for illustrations. A true shakeup of the genre arrived with Richard Crossley. I don’t know Crossley, but one look at his Crossley ID Guide: Eastern Birds leads me to believe that he’s insane. In a mad genius kind of way, though, like Dr. Frankenstein. Like Frankenstein’s monster, Eastern Birds is immense; at 3.8 pounds, it’s the weightiest modern field guide, heavier than, say, a sack of 20 American robins. Like the monster, too, it’s an assemblage of scattered parts, namely nearly 10,000 of Crossley’s own photographs. Each species is presented as a collage of photos, taken from different angles and distances, arranged on a background of the bird’s preferred habitat. As innovative as the Crossley guides are, though, they’re still books. I hate to kick the print industry when it’s down, but it’s inevitable that carrying a paper field guide when birding will soon feel as antiquated as bringing a shotgun to collect specimens. A new range of field guide apps offer a distinct upgrade from paper guides. Obviously, keeping an entire field guide in my back pocket is more convenient than lugging around a three-pound book. Most important, electronic guides (Sibley and iBird make the best) contain the entire wealth of bird sounds. The truth is that birds are most often heard and not seen, and a keen ear for birds’ unique songs, calls, chip notes, and flight sounds is what distinguishes the best of birders. Relating a bird’s call in a paper guide can be hilariously futile. Here’s the Stokes Guide on the song of the Nelson’s sparrow: “A harsh unmusical crt tshhhhhhhjut.” Should have no problem hearing that, right? The inclusion of actual audio with images into one device has proven incredibly useful for learning in the field. Not that bringing a library of bird sounds into the field doesn’t have its drawbacks. Debates rage in the birding community about playing bird songs or calls in order to lure birds in for a better look. Opponents of playback say it stresses birds out and distracts them from attending to actual life responsibilities. Proponents of limited, responsible playback—myself included—counter with mostly half-formed retorts, including “It’s only for like two seconds” and “Leave me alone.” The scientific jury is still out, but the debates will still simmer. As much as some birders still long for the days of keeping a weathered Peterson in their back pocket, field guide apps are here to stay. However, whether the field guide is paper or electronic doesn’t change the fundamental challenge of birding: knowing how to look at a bird. Field guides are used only for preparation or in retrospect; the actual business of birding remains between you, the bird, and your binoculars. That is until our Google Glass can ID birds on the wing or our phones can scan a molted feather and report the subspecies. I give it a year.